The Vault of Horror (1973) Review – AiPT! Only one year after Tales from the Crypt, Amicus came out with another five stories taken from the classic EC horror comics, this time titled The Vault of Horror. A more than worthy follow-up to the last film, Vault flows together with Crypt so perfectly that you’d almost think they’re both just two halves of one really long movie. The framing device which introduces the stories features five men trapped in a graveyard vault, recounting their nightmares to one another. I was a bit disappointed that the Vault Keeper, the host of the Vault of Horror comic book didn’t get to make an appearance, but despite that, the framing device works just fine. In the first story, “Midnight Mess”, a greedy brother tracks his wealthy sister down to a secluded town with murder on the agenda. After committing the deed, the brother decides to get a bite to eat, though for the life of him he can’t figure out why all the locals dread nightfall so much. Upon entering the restaurant, he quickly finds out. “Vault” starts out good and strong with this story. The entire scene in the restaurant at the episode’s conclusion is brilliantly done. You see the pay off coming, but the build-up is superb and the way they reveal the reality of the situation to you is suitably clever. The money shot at the end is, unfortunately, censored, but you can find uncut production photos online if you look hard enough. In “The Neat Job”, a newlywed discovers that her rich new husband is a total neat freak, emphasis on the “freak”. As he becomes violently upset at the smallest alteration to his daily routine, she begins to unravel. One of the less exciting stories, all things considered. They play it off more as a dark comedy, as you’re supposed to find humor in the husband’s neurotic cleanliness. While it is mildly entertaining, it’s never all that funny. Although the ending is terrific, it still doesn’t make up for how dull the majority of the episode is. In “This Trick’ll Kill You”, a magician and his wife visiting the Middle East discover a rope-charming trick that they desperately want to add to their act. They’re so desperate, in fact, that they’re willing to resort to murder. As they attempt to figure the trick out they realize that it’s much more dangerous than they had anticipated. Perhaps my least favorite of the five stories. While most EC horror tales follow a certain formula that make them predictable on some level or another, this one felt more cut and dry than any of the others. The title pretty much gives the ending away for you and the pacing telegraphs the finale even further. While the climax is enjoyable, it’s decidedly ho-hum. “Bargain in Death” features a man plotting to fake his own death and split his insurance money with his partner in crime. The one catch is that he has to rely on his partner to exhume him from his grave before the air runs out. Unbeknownst to either, a pair of bumbling medical students intend to steal the man’s cadaver for studying purposes. This one is far more tongue-in-cheek than any of the other episodes, which makes it stick out a bit awkwardly, but not in an entirely negative way. The end result is a rather funny gag, though the humor is balanced out with a fairly dark ending. In the last story, “Drawn and Quartered”, a struggling artist seeks revenge on a trio of art merchants who cheated him out of a hefty chunk of change. Traveling to the voodoo-rich sectors of Haiti, he returns with the ability to draw anything he chooses and then have whatever mutilations he inflicts upon those drawings occur in real life. The artist then proceeds to take his revenge, though he soon regrets having drawn a self portrait. They definitely saved the best story for last. I originally saw this movie when I was a kid and this was the only segment I committed to memory. The ways in which the artist’s victims meet their fate in relation to the wounds inflicted on their portraits are remarkably clever and gruesome. I particularly like what happened to the art dealer. 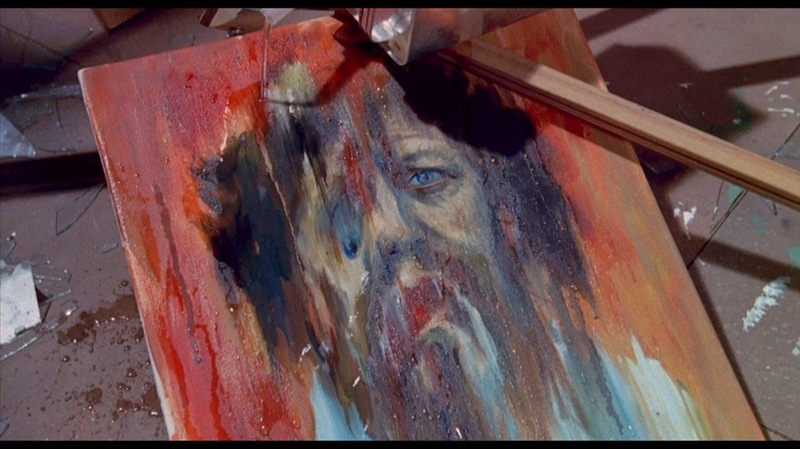 The artist’s comeuppance is wonderfully horrific despite being surprisingly low on gore. The Vault of Horror is a perfect follow-up to Tales from the Crypt, so much so that I can’t stand to watch either film separately. Even if it is a shade more uneven in quality than its predecessor, Amicus never-the-less did a great job adapting these stories from the comics.